Welcome to the Program and thank you for taking a closer look and learn about our students. The RIT’s Diagnostic Medical Sonography Program student population is consistently diverse. It consists of individuals of various ages, cultures, backgrounds, and experiences. We believe this mixture allows students to learn about and from each other. The program faculty and staff employ all the means necessary to reach all groups and develop avenues for increasing all forms of diversity within the program. We believe that our students are intelligent, hard-working, compassionate, innovative, respectful, inspiring, creative human beings. For a moment, we would like you to think of a university as a human body, if one part of the body aches, the rest of it will ache. Think of the faculty, administration, and staff as the central nervous system. The central nervous system directs, organizes, and guides the organs to function properly. Now, where do our students fit in this scenario? Are they the arms, the legs, the eyes or what? We believe they are the blood that rejuvenates the whole system and allows it to thrive and survive. The program faculty, staff, and students work together and strive to build a true community of spirit and purpose based on mutual respect and caring. Indeed, we are committed to teaching excellence, learning effectiveness, and overall students’ growth and development and preparing them for successful career development over their lifetimes. Moving from high school to college is a major endeavor and can be stressful. The Ultrasound Program faculty and staff understand that and do their best to make the application process and transition very accommodating. Yes, we make the admission process a very personable one. Our class is very diverse. Students come from different backgrounds, beliefs, and interests. The diverse background of students creates an environment which resembles the environment in a hospital where patients come from different backgrounds. This early introduction to different cultures and groups allows the students to better communicate with patients, understand their needs, and flourish in this rewarding medical and imaging profession. All high school graduate applicants to the Ultrasound Program must comply with the general admissions criteria for all RIT programs. Admission to the Program is based upon academic skills as demonstrated by course work and/or College Board scores. Motivation, personal maturity, and both written and verbal communication skills are also important factors in admission decisions. A personal essay and letters of recommendation are required for acceptance into the program. Transfer students applying to the DMS Program must comply with the general transfer admissions criteria for all RIT programs. The amount of transfer credit awarded a student is determined by an evaluation of individual courses in which a grade of "C" or above was received. In order to facilitate the transfer, students are encouraged to parallel their two years at the alternative institution with the first two years of the program offered at RIT. Students with a degree may transfer directly into the junior year of the program provided they have the necessary collateral and core requirements completed. Students who are applying for the Certificate Program must complete certain prerequisite courses before entering their internship year. The certificate option is available to those who have an associate's degree or baccalaureate degree in the health sciences or related fields with two years’ experience in the health field (or the equivalent combination of education and experience). Preference is given to applicants whose natural science course work has been completed within the last ten years. It is highly recommended that you contact the program director to obtain information about the transfer process into the program. Our class is very diverse. Students come from different backgrounds, beliefs, and interests. The diverse background of students creates an environment which resembles the environment in a hospital where patients come from different backgrounds. This early introduction to different cultures and groups allows the students to better communicate with patients, understand their needs, and flourish in this rewarding medical and imaging profession. Many are involved in ultrasound education and a great number act as our didactic and clinical instructors. Numerous others hold supervisory positions at local, regional, and national hospitals. Others have pursued careers through medical, dental, veterinary or graduate schools. They also hold high-level positions in local and national professional ultrasound organizations. RIT’s Ultrasound Program is very proud of its tremendous success in placing its graduates, and it takes sincere interest in their development long after they have left the RIT campus. It has been a norm that the majority of our graduates receive job offers before graduation. A 100% of our graduates receive job offers within 3 months after graduation. The Ultrasound Program faculty and staff are highly committed to assist our graduates accomplish their goals during and after graduation. The program maintains very close connections and relationships with its graduates. Ms. Le Cu is the first one in the history of the program to pass the physics exam before graduation! This year the national certifying organization for Diagnostic Medical Sonography has agreed to allow our students to take their physics exam before graduation. Therefore, Ms. Le Cu is the first one in the history of the program to pass the physics exam before graduation! What an outstanding accomplishment for her. Please congratulate her if you happen to know her or run into her. I am sure we will hear about more success stories from other students soon. Prajna Chopra received the 2009 John Wiley Jones Award for Outstanding Students in Science. Academically speaking, Ms. Prajna Chopra is an outstanding student who has high expectations for herself. After graduation, Ms. Chopra has been accepted to the University of Maryland Medical School. Currently, she is completing her 3rd year of medical school and continues to be involved with various activities of the RIT ultrasound Program. 3rd year Diagnostic Medical Sonography (Ultrasound) major, Adriaansen earned her first All-Empire 8 honor after a stellar season in 2008. She is tied for third on the team in scoring with nine points on two goals and five assists. Over the last two seasons Adriaansen, RIT's Sportswoman of the Year, has dished out 12 assists and is first all-time in assists at RIT with 14. A 4th-year student and a hockey player : Served as an assistant captain, Led the nation with 33 assists, l, named to the ECAC West All-Academic Team, lifted RIT to a 4-1 win over Norwich in the NCAA National Championship in 2011-12 season, garnered All-ECAC West Honorable Mention accolades in 2010-11 season, Holds the RIT record for longest point-scoring streak at 23 games, spanning the final nine games of 2010-11 and first 14 games of 2011-12 … had 32 points (4-28-32) during that stretch … also holds school mark with a 14-game assist-scoring streak (20 assists) … fifth all-time at RIT with 71 assists. 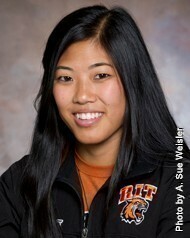 Read more at http://www.ritathletics.com/roster.aspx?rp_id=8685&path=whock. This organization was established to build a bridge among students, and between students, faculty, the profession and the society at large. All students of the Ultrasound Program at RIT are represented by this Association. The Association holds meetings to discuss not only issues that face students during their learning process, but also, issues that are facing the profession. It also allows students to meet each other. The Program Director/Clinical Coordinator acts as the advisor for this organization. One of the Program faculty members usually attends the Association's meetings. At these meetings, students and faculty communicate program news and events and address issues that may help students succeed in the Program and profession. The Association holds meetings with program faculty members on a regular basis. These meetings provide an opportunity for students to air any concerns or questions and for the faculty to respond with information, support, and suggestions to students. These meetings serve to keep students focused on their progress and success within the program and how they may contribute to the profession and society. The Association works hard to promote unity among students. Members of the Association volunteer their time to mentor other ultrasound and prospective students about courses and the Program. The Ultrasound Student Association is involved in a variety of activities on- and off-campus. The Association has participated in ultrasound demonstrations, conferences on the local and national level and helps to educate high school students about the profession. In addition, the Association holds fund-raising events to support national research activities such as the Heart Walk, the March-of-Dimes and much more.